This large open-plan kitchen, living and dining area takes up the entire first floor of Chalet Riondaz. This space is ideal for families to relax around the real log fire after a long day on the 3 Valley ski slopes. Chalet Riondaz has a large open-plan Alpine kitchen which is well equipped for self-catered skiing holidays. Chalet Riondaz has several balconies from which you can enjoy the surrounding mountains. This 14 people chalet in the Three Valleys offers lots of space for large families & groups of friends. The dining table seats up to 12 people - Perfect for large family dinners during your skiing holiday! This luxury ski chalet has been renovated to a very high standard making it one of the best self-catered chalets in St Martin de Belleville. Chalet Riondaz offers several seating areas, giving large families and groups the option to spread out and be comfortable! Chalet Riondaz is a ski chalet with many balconies and outside seating making the most of it's mountain views. Chalet Riondaz offers more than the usual ski chalet. A spacious boot room with lots of storage and boot warmers, a separate TV snug as well as utility room with washing machine and drier. This large double bedroom has an en-suite bathroom (with bathtub) as well as access onto a lovely balcony. A different angle of the bedroom N4 on the second floor of Chalet Riondaz with private balcony and beautiful mountain views. This downstairs double bedroom has a doorway at the right-hand corner of the room leading to an en-suite bathroom as well as a separate lounge and small kitchenette. Compact twin / double bedroom with built-in cupboards for storage. This bedroom has it's own private bathroom. Alpine chalet with lots of rustic wood - A traditional and stylish ski chalet in St Martin de Belleville. The upstairs bedroom in Chalet Riondaz is bright and spacious. It has a double bed, en-suite bathroom (shower) as well as access onto a private balcony. A different angle of bedroom N6 showing its en-suite bathroom and built-in cupboards. Everything in this chalet has been custom made. Chalet Riondaz is a real home from home set in the beautiful village of St Martin. Just a 5-minute walk from the village drag-lift and with breathtaking mountain views from the various large sun terraces and stunning bedrooms, this is the perfect family ski chalet. It comes with a brand new, spacious boot-room (with bootwarmers and heaps of storage space for your ski equipment), 6 bedrooms and bathrooms as well as a gorgeous kitchen, dining and living room area occupying the whole of the 2nd floor. The chalet has been renovated to a very high-standard with the finest of materials being used throughout. The fireplace in the cosy lounge is just perfect for snuggling up in-front of after a long day on the slopes, and the large terraces are the ideal sun-traps for enjoying your morning coffee or afternoon après-ski drink. Chalet Riondaz has the space, ambiance, décor and layout that any large family would dream of having for their ski holiday! Chalet Riondaz is ​tucked away on a quiet residential ​street, in the heart of St Martin de Belleville. Within less than 150 meters from the village​-centre​ drag lift,​ this chalet is ​within close​ walking distance from the​ slopes. ​A great location for families or for ​a large group of friends ​who don’t mind walking a couple of minutes to go skiing. 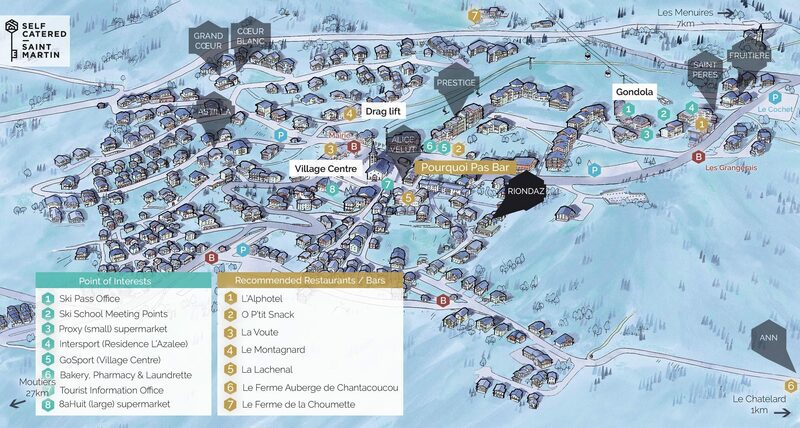 W​hilst being close to all resort amenities such as the 8-​à​-​Huit supermarket, tourist office, the village’s best bar [Pourquoi Pas] and several renowned restaurants, you are set back enough from the hustle and bustle to be able to enjoy the haven of peace that Chalet Riondaz offers. Chalet Riondaz comes with one parking space in front of the chalet​,​ and then further free parking can be found around the village. The prices above allow up to 12 people in 6 bedrooms and 6 bathrooms. Additionally a 7th annex room can be added for an additional charge – This room can sleep 2 further people on two single sofa beds.